The baseline telemetry budget yields a daily data volume of 435 Gb. The data products will be reformatted into a standard self-describing format in common use by the astronomical community (e.g. FITS). The imagettes of selected targets for all individual telescopes. The validated light curves and centroid curves of selected targets for all individual telescopes. These are all the downloaded light curves (one each from each star and from each telescope) as well as the centroid curves, validated by assessing the quality and integrity of the data. They do not include instrument corrections other than those already applied on-board. Ancillary data, e.g. pointing information. The calibrated light curves and centroid curves for each target, corrected for instrumental effects such as those related to temperature sensitivity, some specific CCD corrections, and a posteriori jitter correction. Level-1 treatment includes the derivation from the imagettes, when available, of the light curves and centroid curves. Moreover, for the normal telescopes and for each star, the Level-1 light curves and centroid curves are (suitably) averaged, and an associated uncertainty is provided. Processed imagettes of selected targets and images of sky regions. The planetary transit candidates and their parameters, as a minimum target identifier, planetary ephemeris of the system, depth and duration of the transit, estimated radius, and their corresponding uncertainties. The results of the asteroseismic analysis, and their corresponding uncertainties. The stellar rotation periods and stellar activity properties inferred from activity-related periodicities in the light curves. The seismically-determined stellar masses, radii and ages of stars, (and their formal uncertainties), obtained from stellar model fits to the frequencies of oscillation. The list of planetary systems confirmed through the detection of Transit Time Variations (TTVs), which will be characterised by combining information from the planetary transits and the seismology of the planet-hosting stars. 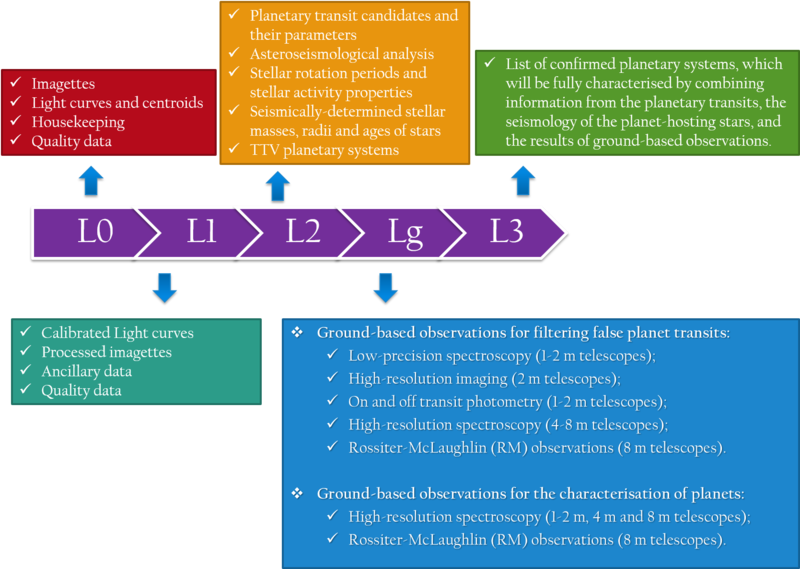 The list of confirmed planetary systems, which will be fully characterised by combining information from the planetary transits, the seismology of the planet-hosting stars, and the results of ground-based observations. Rossiter-McLaughlin (RM) observations (8 m telescopes). From these ground-based observations, false-detections will be identified and the number of targets for the next steps reduced. For these ground-based observations raw, calibration and processed data will be available. From these observations, high precision measurement of radial velocity variations of the central star will be obtained. Cross-correlation function results will be available together with the spectra and derived radial velocities.